I know I talk a lot about practising, but it is so important I can’t ignore it. Practise is the vital component of being able to play well. The linchpin. The thing that brings everything else together. You can have the best teacher in the world and turn up every week for your lesson, but if you do no work in between lessons, you simply will not improve. Because of this, I post often about practicing. Different tips and techniques will resonate with each person or family, so I like to throw into the mix as many ideas as possible. These three points are not really tips, though – they are fundamentals. They are the three things I push with all my students from day one. I’m sure sometimes I sound like a broken record! Slow down and take your time. It can be frustrating when you know how the piece sounds and you just want to play it at speed so the familiar sound and what you are playing are closer together. But playing too fast doesn’t allow you to really pay attention to what you’re playing or note the areas that need additional work. It allows the brain more time to comprehend every aspect of the piece and understand the overall picture or structure. Physically, it can also help with tension. When we are playing a difficult passage, we will often subconsciously tense up and become stiff, particularly with fast sections. When playing slowly the body is more likely to relax, allowing for more freedom of movement and improved sound quality. There is no such thing as too slow! Even though I have been playing for over 40 years, I still find counting out loud is the easiest way to get my mind around a complicated new passage. It is particularly crucial for beginners and works excellently in conjunction with the point above about slowing down. Counting out loud helps develop a sense of rhythm; the physical act of counting makes the rhythm more dominant and the hands tend to follow. As an extension, clapping the rhythm can also be useful; it allows you to hear and understand the rhythm before adding in the melody. Similar to pulling difficult passages out of a whole song, playing with separate hands helps to reduce complexities into manageable tidbits. Practising the left hand separately. Think about technical development in areas such as scales and arpeggios – it is always learnt playing with separate hands first. Even the AMEB technical syllabus introduces new concepts with separate hands for a grade/year before they are brought together the following year/grade. It is only once these techniques are mastered that the hands are brought together. In many cases this philosophy can be taken into the pieces we play as well. Playing hands separately allows the muscle memory of each hand to be continually reinforced, which makes it easier to then bring them together. Practicing hands together is not twice as hard as practicing hands separately—it is at least four times as hard. As your playing becomes more advanced you will come across pieces where each hand is a separate voice or voices, and you want to hear and understand how they sound in isolation so each one can be shaped into an independent voice before putting them together. Separating the hands is useful in the majority of instances, but may not help in pieces where the melody is constantly flowing between the two hands. If still having trouble, play each hand separately. 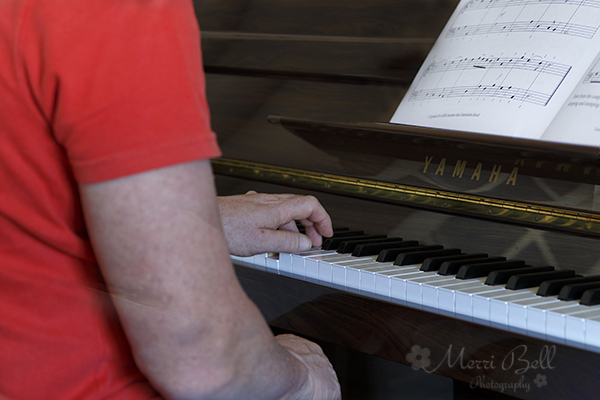 This entry was posted in Practice Tips, Practise Tips and tagged adult piano lessons, music lessons, piano, piano lessons, piano lessons Newcastle NSW, piano lessons Wallsend, piano practice, piano practise, piano teacher, piano teacher Newcastle NSW, piano teacher Wallsend on February 11, 2015 by Merri Bell.